Learn the ins and outs of starting your own babysitting business. Learn how to market your business, best practices, basic first aid, and what to do while you’re babysitting. 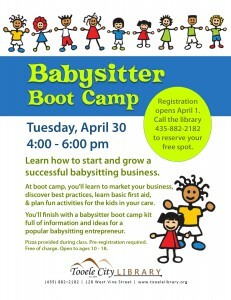 You’ll leave with a babysitter boot camp kit full of information to become a successful babysitting entrepreneur. Pizza will be provided. Registration opens April 1 (required). Open to ages 10 – 18.